Here is our top-of-the-line 79” jumbo corner entertainment center, the biggest one our Amish builders make without a special request. Carefully handcrafted of solid oak, this beast stands a full 6.5 feet tall, and comes in two pieces - top and bottom - to make moving it easier. 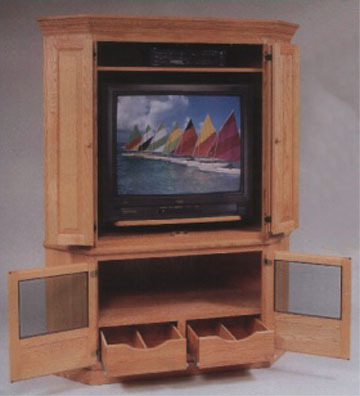 It features one adjustable shelf at the top for your VCR, DVD Player or whatever else you choose to put there, and a slide out swivel platform for your TV that is rated at 200 lbs., all of which can be covered by a pair of solid oak, raised panel bi-fold doors. The bottom section features a couple of drawers with handy tape dividers in them, and a large open space for all the audio components, attractively enclosed behind a pair of doors with smoked glass panels so you (and the remote controls) can see all of your audio components. Can the Amish top this? Well, maybe..... They added a very attractive moulding along the top edge to make the image complete.